These Walnut Finsih Perpetual Plaques can be used for Employee of the year, Salesperson of the year? These Plaques are a economical alternative to the standard Solid Walnut styles of Perpetual Plaques. These Perpetual Plaques come in several styles and sizes to choose from. Walnut finish perpetual plaque with 24 black engraving plates and matching header plate. Boasts exclusive magnetic release. Individually boxed. 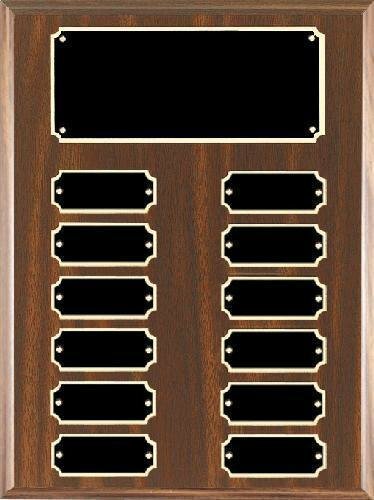 This Cherry Finish Perpetual Plaque is a great way to create an awards wall with perpetual winners. Great for employee recognition, donor recognition, church recognition, achievement awards and more.